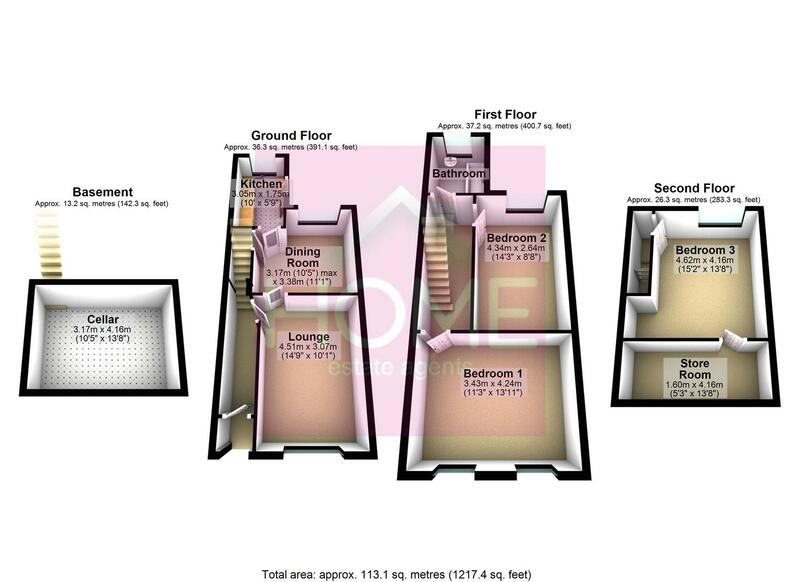 THREE DOUBLE BEDROOM TERRACE WITH CELLAR !! HOME ESTATE AGENTS are pleased to bring to the market this well presented terrace property which boasts three double bedrooms spanning over four floors. In brief the property comprises of, storm porch, hall, lounge, dining room and kitchen, to the first floor there are two double bedrooms with a family bathroom, on the second floor is a large double room with storage room, the property also benefits from a cellar and is UPVC double glazed throughout with gas central heating. With good local ammenaties, parks and schools with great transport links into Manchester City centre including the Metrolink. To arrange a viewing call HOME on 0161 871 3939. Wood front door leading in, wood floor and single panel radiator. UPVC double glazed window to the front elevation, wood floor, feature fireplace, ceiling coving, wall and centre lights and double panel radiator. UPVC double glazed window to the rear elevation, wood floor and single panel radiator. UPVC double glazed window to the rear elevation, wood door to the side elevation, wall and base units fitted with roll edge work surfaces incorporating sink with mixer tap, tiled splash backs and floor. Access to all floors with open balustrade to the stairs. UPVC double glazed windows to the front elevation and single panel radiator. UPVC double glazed window to the rear elevation, laminate floor, large storage room ideal for en suite and single panel radiator. UPVC double glazed window to the rear elevation, three piece fitted bathroom suite comprising of, bath fitted with shower, low level W/C, sink with pedestal, tiled to compliment and single panel radiator. With lights power and single panel radiator. To the rear of the property is a courtyard garden with access to the rear entry.